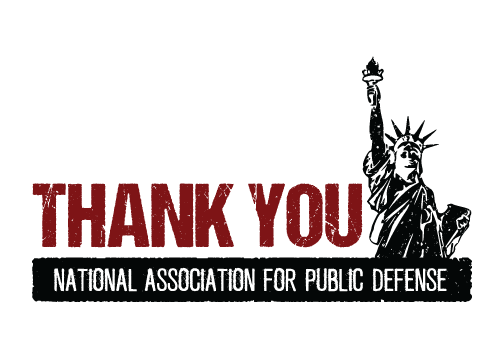 The National Association for Public Defense (NAPD) is supported almost exclusively by membership dues. Annual membership costs $30 for individuals, and $25 for individuals joining with their entire organization. These dues support three part-time staff members, expenses for printing and postage, limited travel, book-keeping services, and modest technology improvements. NAPD is a virtual organization and spends no funds on office space, utilities, equipment, phone and internet, or other “brick and mortar” expenses. All substantive work of NAPD – thousands of hours – is undertaken by NAPD members, virtually all of whom are public defense providers in justice systems throughout the country. In 2014, NAPD received one-time funds from the Open Society Foundation to support scholarships for twenty-two defender leaders to attend the Workload Leadership Institute in Lexington, KY. In 2014, NAPD also received one-time funds from the Society of Counsel Representing Accused Persons (SCRAP) in Seattle, WA. These funds were used to support the technological needs of NAPD. The platform that supports MyGideon is made available to us through a partnership, and was funded by Atlantic Philathropies through 2017. NAPD thanks Dean Andrea Lyon and Events & Continuing Legal Education Manager Lorrie Hodge (among others) at Valparaiso Law School for support and logistical assistance for the 2015 and 2016 Leadership Institutes, and to the Kentucky Department of Public Advocacy who hosted the Executive Leadership Institute in 2017 and will host again in 2018. St. Louis University School of Law hosted NAPD's 2017 Workloads Conference and the Denver State Public Defender's Office will host the 2018 Investigators and Social Workers Conference in March 2018. Many thanks to all. Beginning in 2016, NAPD began to recieves funds from the Office of Justice Programs at American University to defray travel costs for on site technical assistance coordinated through the NAPD Systems Builders Committee. In 2016, NAPD received funds for administering a grant from the John & Laura Arnold Foundation that supports workloads advocacy in Louisiana. This grant will run through 2017. In 2016, NAPD receibved funds through its successful application to the Bureau of Justice Statistics (within the U.S. Department of Justice). This application was made in partnership with the Urban Institute and the Indigent Defense Research Association. It will run through July 2018. NAPD is a 501(c)6 organization, as approved by the Internal Revenue Service. NAPD sincerely thanks its members, donors, institutional funders, and collaborating partners.